The Austin Chamber Music Center presents the third event of its A Moveable Feast concert series: Two of Swords. The series fuses live chamber music with other art forms in a unique environment. 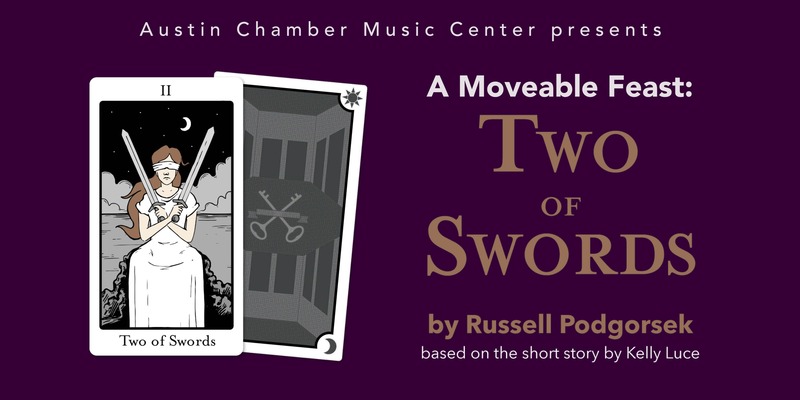 Two of Swords is a new, interactive chamber opera by Russell Podgorsek based on the short story by Kelly Luce. The piece features mezzo soprano Page Stephens and string quartet invoke. Tickets include hors d'oeuvres and one drink ticket for the bar. The March event will be co-sponsored by ZACH Theatre and Gusto Italian Kitchen + Wine Bar to provide delicious food and a beautiful view of downtown Austin. Award-winning author Kelly Luce‘s short story “The Two of Swords,” written expressly for this project, tells a tale about relationship violence, art’s ability to empower people, and the process of reading one’s tribulations and solutions into fortune-telling. Podgorsek's work is a dramatic adaption of the story for string quartet, mezzo-soprano, and actor. The musical work will exist in a series of episodes (corresponding to chosen major and minor arcana cards in a tarot deck) plus a prologue and an epilogue. The actor will be the “fortune teller,” engaging with the audience and “reading their fortunes” thereby determining the order of the movements and also the narrative pace of the story. Invoke, the featured string quartet at ACMC's inaugural Moveable Feast event, will serve as both “orchestra” and “Greek chorus”, singing the marginalia notated in the story in italics. The custom tarot deck is designed by local artist Rachael Holt, with the imagery for the major arcana drawn from the story itself. Page Stephens is a seasoned new music mezzo-soprano and an actress; she will sing the role of the narrator of the story.